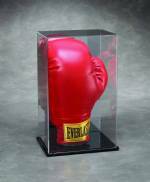 A perfect gift for any boxer, this acrylic, UV enhanced display case is the perfect way to showcase boxing trunks that have meaning. Trunks hang on an acrylic hanger within the display. Case has hinges on either side and front opens like a car hood. Measures 24 1/2" long x 4 1/2" wide x 14" high. Hanging hardware included. Case is proudly made in the USA. Please note that this case is made at the time of order for you, and may take several weeks to build and ship.